Slavery is a stubborn oppression. Men and women who understand God’s heart for the poor and oppressed have fought slavery, at tremendous personal sacrifice, and won great victories, like William Wilberforce’s Slavery Abolition Act of 1833. Yet today slavery is more rampant than ever, endemic to virtually every community, epidemic in many places. An estimated 27 million souls — 80% women and children — suffer in involuntary servitude, many of them in horrible circumstances. Laws can make a difference in the social realm, but evil thrives nonetheless, because it sinks its roots into the dark, fertile soil of each individual’s heart. The hard-won political and legal victories achieved by activists cannot change the individual heart. That immutable fact brings us face to face with a profoundly personal truth: If you want to abolish slavery — if you want to stop any injustice — you must get personally involved. You cannot leave abolition to the activists who lobby lawmakers. You have to take stock of your own life and how your lifestyle supports slavery. You have to look around for the slavery forced upon others in your own community, even in the house next door. You need to inform yourself about the evils of slavery around the world and find a partner to help you get involved. And we wind up doing nothing. A little girl is chained to a bed at a sleazy motel out by the interstate. A little boy labors from dawn til dark on a cocoa farm in Ivory Coast. Women and men slave away in a Pakistani brick factory for meager rations and a hovel to sleep in. So the evil in your heart isn’t the one that forces people into slavery. Instead, it’s the one that does nothing while your neighbor suffers, the one that buys the goods and services produced by the slave master. Shayne Moore and Kimberly McOwen Yim have a different idea. What if you refused to do nothing? In their new book, Refuse to Do Nothing, these two “Abolitionist Mamas” talk about how they discovered the power to make a difference that was available to them in their everyday lives. The book is a discomforting read, but it is very practical. You will discover you do have power you can exercise — through your purchases, your relationships, and the advocacy opportunities a free society offers. You will discover you can make difference, right where you are, to set the captives free. Their stories may well inspire within you the kind of fierce love that drives you up out of your easy chair and into action. Each of the book’s 15 chapters ends with questions for reflection that will help you zero in on God’s call for you to “do justice” or serve as a discussion guide for your small group. You will find lists of resources for further study and organizations that can help you make a difference. A set of five related videos is available at ivpress.com. Can you live with the thought that you could have prevented an innocent soul’s suffering, yet chose to do nothing? 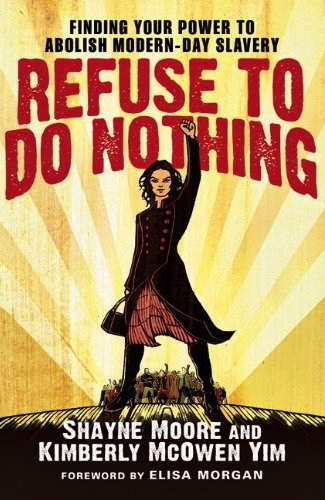 What if you refused to do nothing?